AVR-JTAG firmware upgrade is done through the AVR Studio and internal bootloader inside AVR-JTAG. You must have installed latest release of AVR Studio. 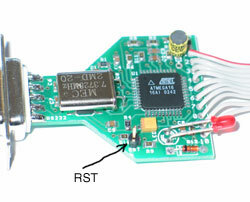 Notes: RST signal is not available on JTAG connector, you must open plastic box of AVR-JTAG and connect it to the pin with this name on AVR-JTAG. As both AVR-JTAG and AVR-PG1B need external power supply it should be provided by adapter or target circuit. Set fuses as on picture above and click on WRITE button. Now AVR-JTAG is in BOOTLOADER mode and can be upgraded. Disconnect power supply, disconnect AVR-PG1B to RS232 and connect AVR-JTAG to RS232 port. Apply power supply. Open AVR Studio and Click on TOOLS->AVR PROG then browse to ...\AVR Tools\JTAGICE\Upgrade.ebn file and do programming. Note uC in dialog box is ATMega163, but this is not a problem. Now your AVR-JTAG has the new firmware and it's ready to operate, so you can close it back carefully inside the plastic box.